First announced several months ago, there has been little information regarding the Sonic Boom Monopoloy game depite both the show and the toyline doing really well, however retailer Forbidden Planet have today posted a listing of the game which includes price and a release date. The game is set to be released on November 30th of this year and it’s priced at quite a hefty £29.99. From the quality of the photo it’s difficult to see what each board sapce is based on, however from a quick inspection it seems to be based on Sonic Boom the TV series and not the disasterous videogame which is exactly one year old today… happy birthday. Furthermore, no game pieces can be seen but money has different characters on it depening on it’s value. Just think, soon you’ll be able to build a hotel complex on Meh Burger or stay at Hotel Del Sticks or own property at Eggmans Base. Going to buy this? Let us know in the comments. We need more of this stuff for the ‘main’ sonic brand too! I miss the days where Sonic backpacks and wallets were a thing, and didn’t need to be sonic boom. Oh well. More sonic is good! And hey, monopoly? Alright with me. Meh. 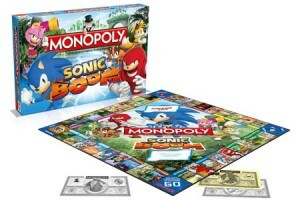 We already have a Sonic Monopoly… I don’t see why this one was necessary. I mean, places like Meh Burger are not nearly as iconic as something like Green Hill. The whole point of these licences Monopoly games is being able to own places you actually recognize and love, but this branch of the franchise has been out for only one year. It hasn’t even really had time TO become truly memorable. I know about it, but pretty much everyone else I know just has that crummy game in their minds when they think of Sonic Boom. I know it isn’t a big deal, but my family tends to buy me Sonic stuff every Christmas as they know I love Sonic. And just like last year I’m going to have to tell everyone in my family NOT to get me anything with the title “Sonic Boom”. I really do not care about this spinoff series, as there really is nothing of value for me in it. I fear the reason it exists is simply money. I think its more for collectors than anything else. Goddamit why are they making so much c**p about this series? because other than the games – everything else is doing well and people enjoy it. I would like to play this but I fear it will crash as bad as Rise of Lyric. Made by Big Red Button. I have Sonic Monopoly… I imagine I’d like this as a gift. This has me very curiously excited, Big fan of the the TV show/Boom in general (excluding games) it was a much needed breath of fresh air in my opinion. Wow, we’re getting Monopoly Boom so soon? Quite surprised, figured Boom would want to build itself up a lot more before pursuing merch like this. Yet again, with the TV show at its season finale, I suppose its been built up quite a bit already. If it doesn’t come with a triple score bonus kazoo, I will be disappointed. we need Eggman’s board game and Puzzy Puppies to be made real. Heh, in all seriousness, having a real Fuzzy Puppy board game would be really cool. I’d buy it. if i saw this in a store that was actually local then id pick it up. theres still no stores near me in an hour radius that sell sonic boom merchandise. Best Sonic Boom game we’ll probably ever get! It had better not be one of those naff monopolys that you buy characters instead of places! Pre ordered this on Amazon a few days ago. They have it set for release on the 20th not 30th and they have a high quality image. Really? 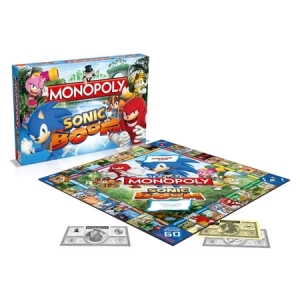 We have regular Sonic Monopoly, was there really that much demand for this? I know for a fact that there’s a main canon Monopoly board games floating around. I guess that wasn’t enough? This is something for diehard Sonic fans who appreciate the main canon and Boom canon. I know they’ll totally buy it and add it to their collection.